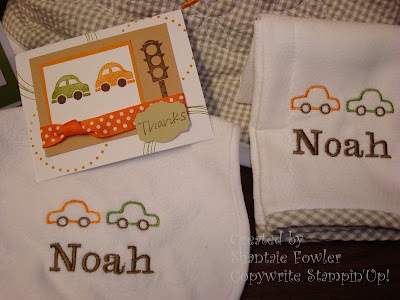 Going somewhere, and By land &, so much were used to make this thank you set that I will be giving the happy new mommy.I matched the embroidery to Stampin'Up! inks old olive, choc. chip and pumpkin pie.The wheels were punched out and attached with glue dots. It all started when I found this "toot"cute sleeper at Target, I had to have it. It became the spring board for the whole gift ensamble. This project encompasses many of my passions. 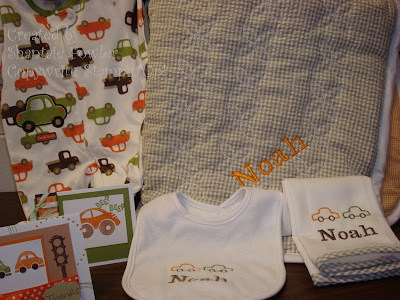 Embroidery, stamping, sewing, and most of all baby gifts! (did I mention shopping) we will discuss that some other time! Noah was born 4 days ago, and I can't wait to see him in this car covered sleeper. I hope this quilt becomes his favorite blankie. What beautiful gifts!! I love Target and all of the inspiration you can find there. Noah and his mommy are lucky to receive this. Wow! What a great gift set! I'm sure it was appreciated, especially since you put in time and effort to make it. Awesome!